Description: Georgia and the South East coast. Original colour. Description: Extraordinary plan showing the unsuccessful Franco-American siege of the British-held city of Savanna during the Revolutionary War. Description: Very interesting map of the state of Georgia as well as the borders of the Creek Nation. Coloured. 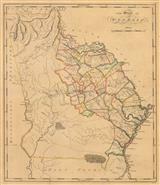 Description: Important early American state map showing early trails and counties. Fine original outline colour. Description: Georgia. Bordered with descriptive German text. Original colour. 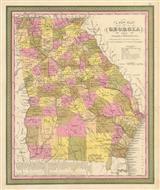 Description: Interesting map showing the new borders of Alabama and Georgia. Coloured. 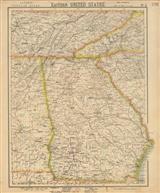 Description: A lithographed map of the state of Georgia in original colour. 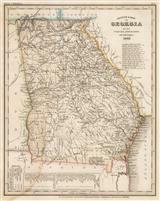 Description: Attractive map of Georgia, with decorative borders and original colour. 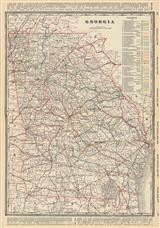 Description: South Eastern United States centring on Georgia. Description: Georgia. St. Simon's Sound. United States Coastal Survey Sea Chart. Coloured. 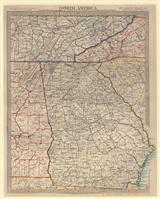 Description: Eastern states from Tennessee and North Carolina, south towards Alabama, Georgia and South Carolina. Printed colour. Description: Miniature map of Georgia set within vignettes showing corn picking and a yellow pine forest. Printed colour. Description: Savannah. Street plan. Original printed colour.